Burgos cathedral (Santa Maria de Burgos) was built in 1221-1567, on the site of a previous cathedral built in the 11th century. The original architect is thought to have been French and the first phase of construction, which ended towards the end of the 13th century, was presumably to his design. Work continued intermittently until the 15th century when efforts were renewed to complete the church, this time to the design of a German master-builder, Juan de Colonia. The classical pediment over the main entrance was added in 1790. 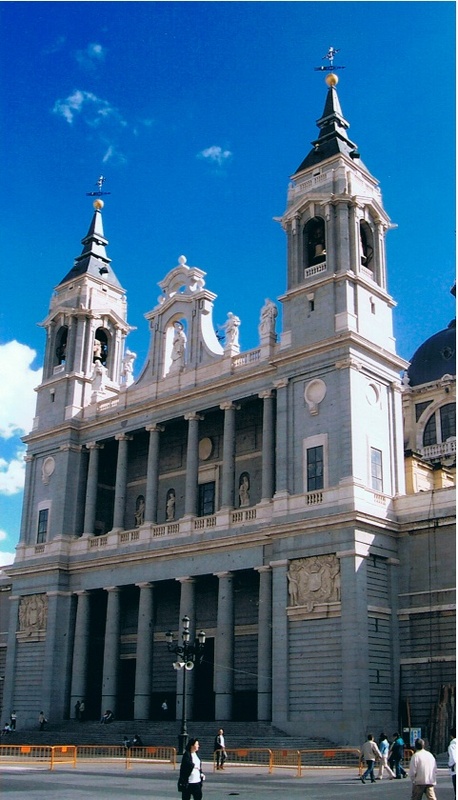 The present Basilica of Our Lady of the Pillar in Zaragoza was begun in 1681 by architect Felipe Sanchez and later Francisco Herrera the younger. Successive additions to the original structure spans almost three centuries and some of the external towers were not completed before 1961. The many domes and towers were principally added between 1796-1872 and the basilica had already been enlarged during various building stages in the 18th century. The baroque church replaced a gothic structure from the 15th century, which was preceded by a church from the 12th century, from which a tympanum on the south wall still stands. A chapel is said to have been begun already in the first half of the first century, only a few years after the crucifixion, and a church was already built during the time of Constantine in the 4th century. 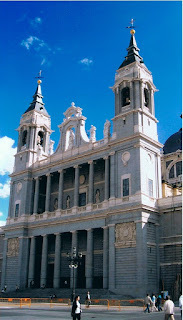 The Cathedral of the Saviour is the co-cathedral of Zaragoza, along with the nearby basilica. The tower was built in 1686-1704 to a design by Juan Bautista Contini and the front was added in the 18th century. The rest of the church was mostly built in the 14th century, after the archbishopric of Zaragoza was created in 1318, and it served as the coronation church of the kingdom of Aragon for about 400 years. The previous church was begun in 1140 and replaced a mosque from the eighth century. San Lorenzo de el Escorial was built in 1563-84 as a royal residence for Phillip II of Spain. The original architect Juan Bautista de Toledo had spent part of his career in Rome, and was succeeded after his death in 1567 by Juan de Herrera. The basilica of San Lorenzo el Real is the central part of the Escorial complex. The original plan was modified from a Latin cross to a Greek cross by Herrera. As part of this modification, the towers were reduced in size and the half-dome planned to go over the altar was replaced with a full dome over the crossing instead. The Royal Palace of Madrid was built after a fire in 1734 destroyed the castle originally built by the Emir of Cordoba in 860-880, and which was turned into renaissance castle by the Spanish kings from 1537 onwards, a new southern facade added in 1610-1636. The original design for a new palace was begun by Filippo Juvarra but the architect died in 1736, and the task passed on to Giambattista Sacchetti. The project was expanded under Francesco Sabatini in 1760 but the new plans were only partially realised and the royal family took up residence in 1764. The Metropolis Building was built in 1907-11 by architects Jules and Raymond Fevrier for the insurance company La Union y el Fenix. It was one of the first buildings of Gran Via, a new thoroughfare that had been under planning since the mid-19th century. Palacio de Cibeles was completed in 1919 to a design by architects Antonio Palacios and Joaquin Otamendi. It was originally the headquarters of the Spanish postal and telecommunications service but has become the seat of the Madrid City Council since 2007. On the left can be seen Palacio de Linares, an aristocratic residence built in the late 19th century. It was begun in 1877 under the architect Carlos Colubi, who was mainly following the designs of the French architect Adolf Ombrecht. The house was inhabited in 1884 though work was not fully completed before 1900. In the distance can also be seen the Alcala gate from 1774-78, which was built into the former city walls as a monumental entrance, by Francesco Sabatini. Almudena Cathedral was begun in 1879 to a neo-gothic design by Francisco de Cubas but was only completed in 1993, due to the political instability of the 20th century. The facades were redesigned in a classical style by architect Fernando Chueca in 1950 to harmonise with the royal palace. Plans to build a large cathedral in Madrid was discussed as early as the 16th century but the main seat of the church of Spain remained in Toledo and the project was not prioritised for three centuries. A mosque is thought to have existed on the site but was destroyed already in 1083 when the christians first took the city.